Last weekend we went on a trip to Melbourne and our first destination? Visiting the new Jardan store! My gosh, it was sooooo good we didn’t want to leave (the poor staff were too nice to tell us the store had closed half an hour ago! Whoops). While we were there, we weren’t ashamed to be those people taking photos of everything so we can share it with you all. They just celebrated their opening party last night so what better time to share 5 tips for styling your living room via Jardan. We love how they converted tree trunks into works of art — you can see two in the photo above (one in the foreground and one in the background). These beauties were throughout the store and their surprising pops of colour, hints of gold and unusual carvings make them appear like treasures from a far away land. Sculptural or 3D art isn’t just for the garden. If you have the space (and budget), a stunning piece like this will transform your living room. We’re all for restraint when it comes to styling but sometimes more is more. 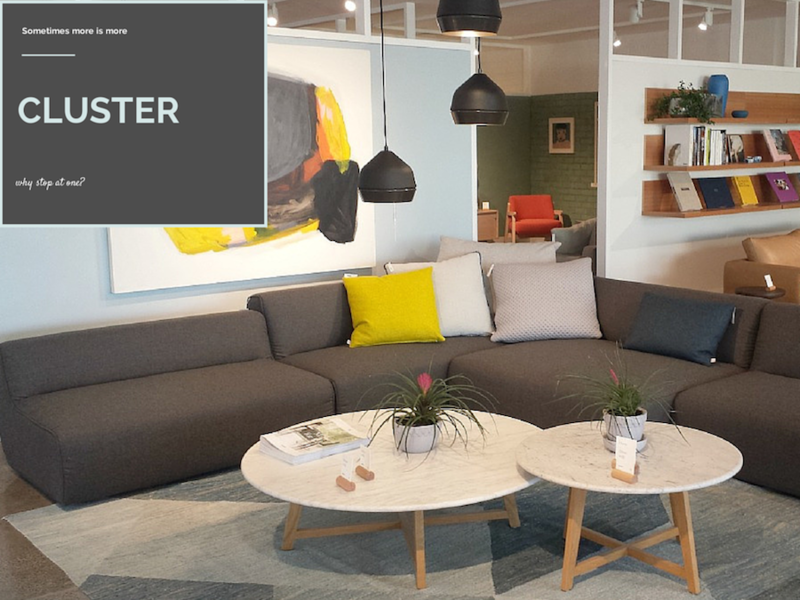 Here Jardan have grouped cushions that complement the artwork, clustered three low hanging matt black pendants, and even paired two sister coffee tables. It works because all the placement is asymmetrical and all the pieces are slightly different (notice the different types of marble in the two tables). A bit of bling using glass pendant lights (the cluster of pendants in this photo is divine) and bronzed mirrored surfaces is a smart way to add stylish design touches to your living room that won’t date or be OTT. Bronzed mirrors are making a comeback in a big way. We saw Darren Palmer give Max and Karstan a big thumbs up for using it in their master bedroom on The Block Glasshouse and it’s making its way into all sorts of furniture pieces (including a +$30,000 sideboard we spotted at another store in Melbourne — it certainly was beautiful though!). We love how Jardan have softened this space with the textured seaters and rug that have burnt orange and dusty pale pink tones. We said it last week in our kitchen decorating tips and we’ll say it again — marble is THE hottest material in home decor and furniture right now. These marble coffee tables with fine wire frame strike the perfect balance of proportions. The soft grey and subtle veins in this marble is one of our favourites but there is an extensive selection of marble out there (we spotted an Emprador Green marble coffee table with copper legs at another store but that is one of the most sensitive marbles out there and not all that practical for a coffee table). 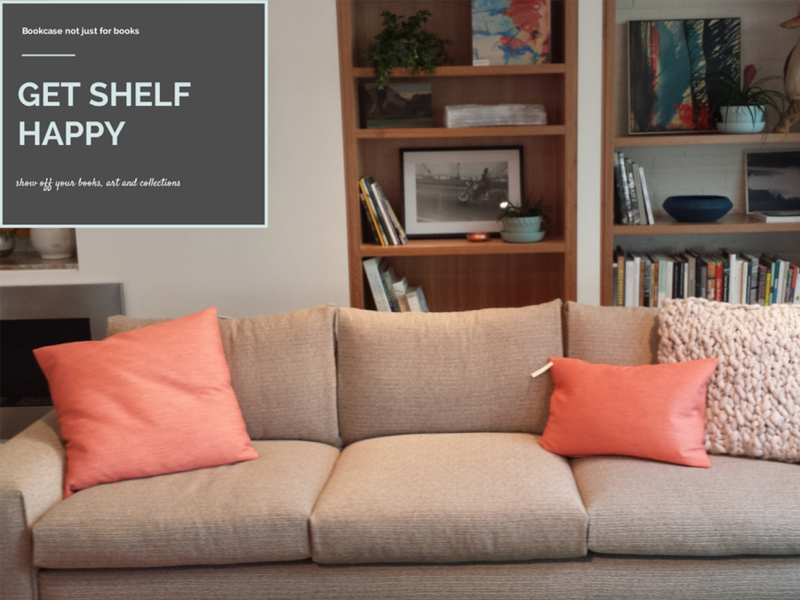 Do you have an open bookcase or wall shelf? Then it’s time to get shelf happy! So often people don’t maximise the styling potential that a bookcase or wall shelf presents (even we have been guilty of it!). It often becomes one of those jobs we’ll get around to later or perhaps random objects have just filled the space over time and you’re left wondering what to do. 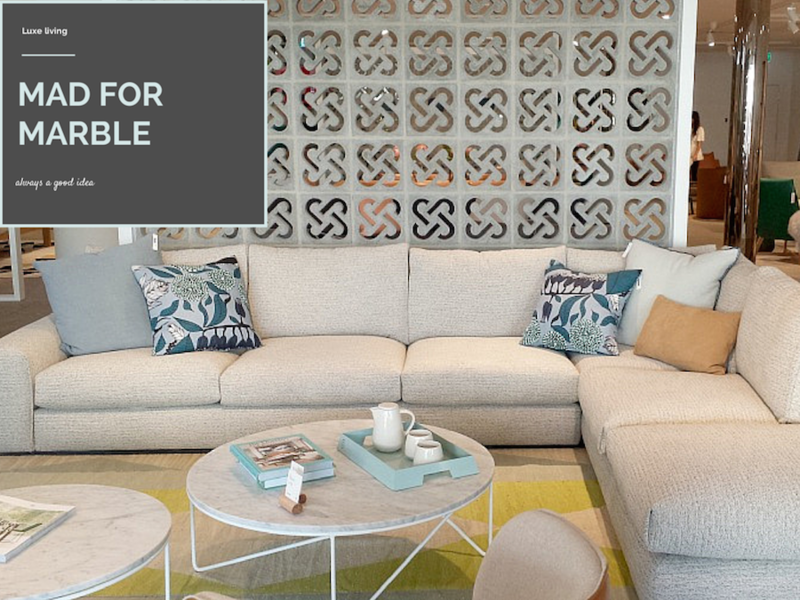 What do you think of the new Jardan store and these living room styling tips? Tell us your top tip for creating a stylish living room! Thank you for these tips, I love it actually and do it when decorating a certain part of a room. I love putting blings like mini chandelier.